Today, with all this snow I can't help but think of winter weddings and what I would wear if I were to say "I do" this time of year. We have a few brave and obviously stylish brides getting married over the next few weeks and I can't wait to see how their winter weddings fall into place. I imagine a lot of candlelight, faux fur, crystal icicles, hot cocoa spiked with Baileys and white fluffy UGGS. Our beloved Jim Hjelm designs the gown above. Many brides are opting for gowns with straps and this French lace/silk organza option is totally decadent.The lace provides a little modestly and a lot of sophistication. The full skirt is playful but not overdone. If I were to remarry Leo (the one and only) I would wear this gown to the church in a horse-drawn sleigh. Maybe my reception would be in Tremblant at a chic hotel and there would be a plethora of Caviar and Champagne. Naya is a work of art. This gown is made of a beautiful Silk Mikado. The silk is slightly thicker and totally appropriate for a winter affair. This crumb catcher neckline is something that we continue to see in couture evening wear and bridal wear. Pair this gown with a vintage faux fur bolero jacket and VOILA...we have perfection! I would re-marry Leo in this gown and have the intimate reception at one of my favourite boutique hotels here in Ottawa, The Arc. This gown is incredibly romantic and totally elegant. 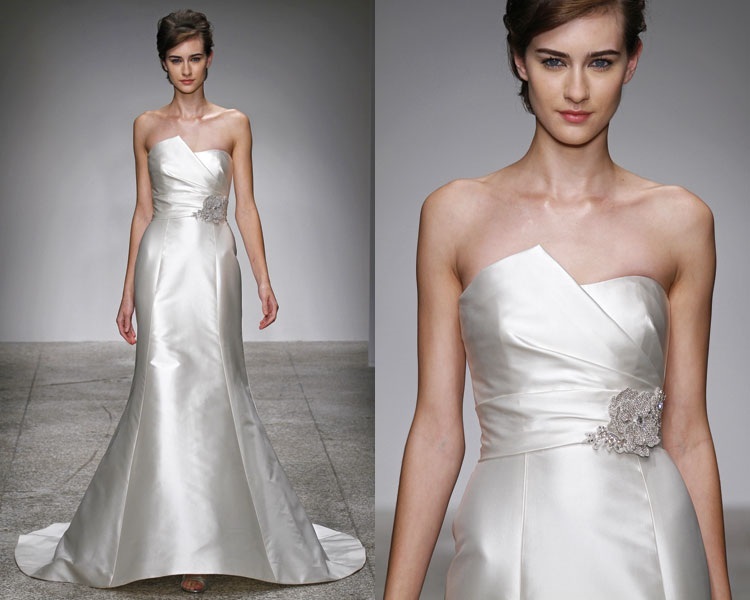 The silk organza sweetheart bodice with faux wrap is a Romona Keveza specialty. The gown spills into several layers of soft silk organza with a final net overlay that creates dimension and texture. This large crystal belt is new to the Romona Keveza collection this season and adds the perfect amount of sparkle. In candlelight this belt would look like a sky of falling stars. 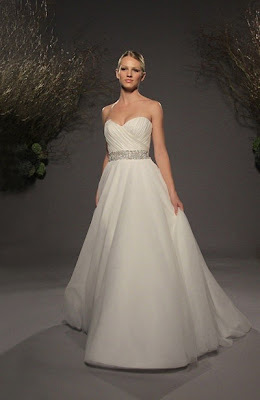 Pair this gown with a long veil scattered with small white polka dots, almost like a light dusting of snow!